State of Oregon Retirement Plan? 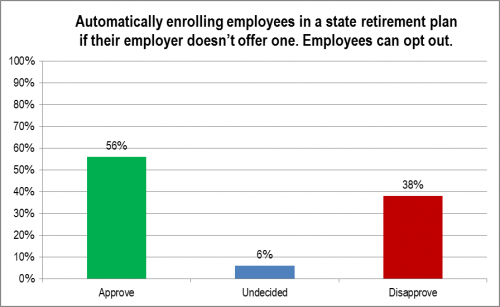 Oregonians strongly support the creation of a mandatory state retirement plan. QUESTION: A number of laws were passed by the legislature and signed by the Governor. Do you approve or disapprove of automatically enrolling employees in a state retirement plan if their employer doesn’t offer one. Employees can opt out. Category: Oregon, Political | Comments Off on State of Oregon Retirement Plan? Free Community College for Oregonians? Oregonians strongly support free community college. Category: Oregon, Political | Comments Off on Free Community College for Oregonians? Oregonians strongly support expanding clean fuel standards. QUESTION: A number of laws were passed by the legislature and signed by the Governor. Do you approve or disapprove of expanding clean fuel standards. There has been surprisingly little change in Oregonians opinion of Kitzhaber since he left office. QUESTION: I am going to read the names of some people. Please tell me whether you have heard of each. IF HEARD OF … Do you have a favorable or unfavorable opinion of ______ IF FAVORABLE OR UNFAVORABLE: Is that strongly or somewhat? Wow, being governor sure gets you noticed. Kate Brown’s name familiarity has increased by half since becoming Oregon’s Governor. IF HEARD OF … Do you have a favorable or unfavorable opinion of ? IF FAVORABLE OR UNFAVORABLE: Is that strongly or somewhat? Oregonians are divided on allowing opt outs of standardized tests. QUESTION: A number of laws were passed by the legislature and signed by the Governor. 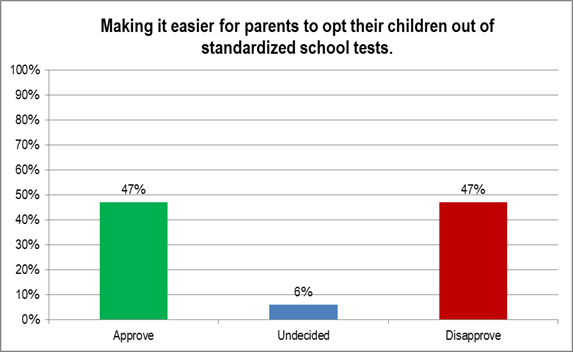 Do you approve or disapprove of making it easier for parents to opt their children out of standardized school tests. Oregon Employer Criminal History Questions Ban? Oregonians clearly oppose banning criminal background questions. Clearly, any way to make this work is to emphasize the exceptions. In principle, however, this has problems. QUESTION: A number of laws were passed by the legislature and signed by the Governor. 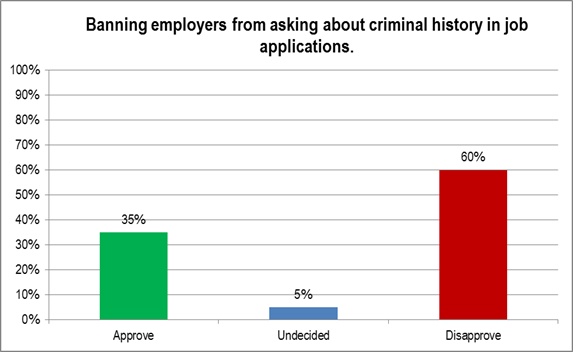 Do you approve or disapprove of banning employers from asking about criminal history in job applications. Category: Oregon, Political | Comments Off on Oregon Employer Criminal History Questions Ban? 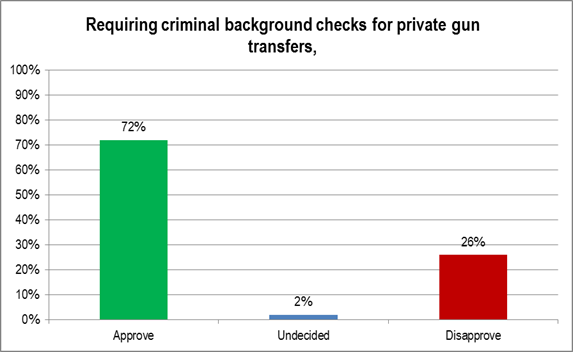 Oregonians strongly support criminal background checks for private gun transfers. 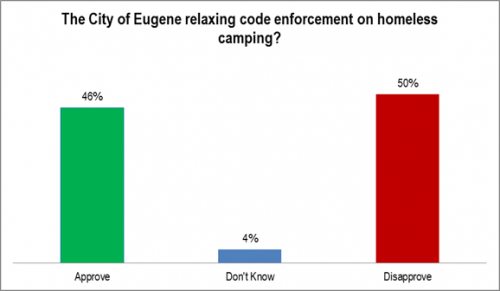 Likely primary voters are about evenly split on homeless camping. Paid Sick Leave in Oregon? Oregonians strongly support paid sick leave. QUESTION: A number of laws were passed by the legislature and signed by the Governor. Do you approve or disapprove of requiring all businesses in Oregon with at least 10 employees to provide paid sick leave. Category: Oregon, Political | Comments Off on Paid Sick Leave in Oregon?